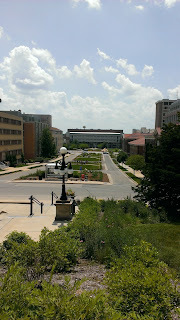 We toured UW Madison with our soon-to-be senior daughter yesterday. The tour took about 2 1/2 hours and was fairly comprehensive. Like the Minnesota tour, it started out with an informational session and then the crowd was broken out into groups and the walking tours began. It was interesting from my perspective because I've been to Madison many times, but haven't really seen much of the campus at all. It was much larger than I expected and campus was surprisingly busy for a July day. We ended the tour by sharing 4 scoops of Babcock ice cream, made from the cows in the UW farm program. It was almost enough to sway her decision. Really, really good stuff! Sarah was impressed with the feel of the campus. She said it is a solid second choice for her at this point. It seems she is set on the U of MN, and I'm OK with that. I'm okay with either choice really. People have asked what it would take to sway her to the UW, and I say only a full scholarship. I'm loyal until the ledger comes into play. It still may play a role if she were to get better offers from elsewhere, but at the moment it's all Minnesota. It's been interesting on Facebook and other places people have said they hope her experience is good, etc, etc. In talking to my wife, we both said when we were going to college that our first priority was, well, going to college. We weren't really thinking about our experience at the time. We tend to look back on our experience now, and neither of us has anything negative to say about them. She and I both agree our college years were some of our best. You're away from home, (sometimes...I wasn't) cutting your own identity, and trying to find out what you want to do for the rest of your life. What can be bad about that? In my case, there was really not much choice on my college options, and thus my "experience". It came down to two choices really, it was either St. Thomas or the U of M. From an affordability standpoint those were my options. My college selection process wasn't at all like today where kids are carted around to various campuses to get a feel for things. I'm not saying it's wrong that we give our kids choices or help them through the process, I'm just saying it wasn't my experience at all. I still find it hard to believe we're at this stage in her life, where we're preparing to send her off. She was just in grade school last week it seems. In any case, we have to let her decide where she feels best. She likes the fact that she'll be close to family in Minnesota, and that counts for a lot. Wherever she lands I know she will rise to the challenge and excel in what she pursues. I cannot say enough about how proud I am of her academic accomplishments. She does most of it without complaint, and with no nagging required. She is a model student and I only wish I had applied myself the way she is herself. I think we can learn something from our kids in that respect.